The economic impact of airports and associated aviation activity is a crucial component of modern economies. However, what is also increasingly important is that this economic impact is fully understood and appreciated outside of the aviation sector. It is for this reason that ACI EUROPE commissioned an all new study, with very thorough approach, which was produced by consultancy InterVISTAS and which was published in January of this year. Donagh Cagney reports. Within the aviation world, the wider economic impact of our sector sometimes seems obvious to us. We see people going into work every day at the airport. We see business travellers departing to strike deals on the other side of the world. We see offices and factories springing up around the airport campus. But what is apparent for us is less obvious for others, and this perception gap threatens the healthy future of aviation in Europe. It is a reality that there are a wide range of policy issues which will have a major bearing upon the growth of Europe’s airports in the coming years. Legitimate concerns over issues such as aircraft noise, wider environmental impacts and depleted public finances, for example, all place decision-makers in positions where they may be tempted to see the curbing of aviation activity as a supposed solution. These temptations are reinforced in some instances by cumbersome planning rules, or politicised decisions concerning airport expansion. However it is crucial that these decision-makers fully appreciate the wider trade off they are making when aviation growth is constrained. The Economic Impact of European Airports study found that today European airports and associated aviation activity create and facilitate a total of almost 12.5 million jobs, or €675 billion in Gross Domestic Product (GDP) each year – that’s just over 4% of the entire European economy. Curbing existing aviation will also cost jobs and growth, while unduly constraining aviation’s future growth will deny us potential jobs and growth. It is worth briefly dwelling on the mechanism by which airports support and drive wider wealth generation. While a large part of airports’ economic impact is associated with those that work within the sector and its wider supply chains, it is the wider catalytic impacts which set aviation apart from other industries. These are the wider economic activities which occur beyond the aviation sector, but which are facilitated and supported by the connectivity that aviation delivers between localities, countries and world regions. Tourists can spend money in previously unreachable locations. Businesses can produce goods to be consumed in far corners of the world. Investors can set up new offices, call centres and factories exactly where they are needed. These impacts have been proven empirically. The Economic Impact of European Airports study looked at macro-economic data for circa 40 European countries over the span of a decade. Taking into account other factors which influence growth, it was found that a 10% increase in a country’s air connectivity was associated with a 0.5% increase in GDP per capita. In a world where sources of growth are increasingly precious, this is a compelling statistic. And it must also be remembered that on a European level, the role of air connectivity is only likely to become even more important in the future. With limited growth anticipated in Europe in the medium-term, it is increasingly important that we tap into those regions in the world where faster growth is expected. The inward investment opportunities offered by the wealth of emerging economies will enable Europe to hire people that would otherwise be left idle. The markets in these regions offer European business sales possibilities and economies of scale which would otherwise be unimaginable. And if the continent as a whole is to benefit from these global economic flows, it is equally important that Europe is properly connected internally also. This can only be delivered by a robust and unencumbered aviation sector. This is a crucial message to decision-makers. However, it also has to be a credible message. In recent years the reality is that a degree of cynicism and even suspicion has crept into readers of economic impact studies. Indeed, some of these reservations have had sound bases. The ‘Economic Impact of European Airports’ report found that today European airports and associated aviation activity create and facilitate a total of almost 12.5 million jobs, or €675 billion in Gross Domestic Product (GDP) each year – that’s just over 4% of the entire European economy. It became apparent from a very early stage of ACI EUROPE’s work that an approach needed to be taken, which would ensure the credibility of not only the ultimate end results, but also the methodology used to calculate those results. For this reason the Economic Impact of European Airports study is a comprehensive and transparent reference. Data sources are provided, key assumptions are articulated, and where there is relevant nuance to arguments within the paper, these subtleties and counterviews are recognised upfront. The various methodological approaches are outlined in great detail, but accessibly, in various technical annexes. One potential drawback to this approach is that as a result the study is quite an imposing document. To ensure that this transparent and comprehensive approach did not deter potential readers, ACI EUROPE published in parallel a smaller synopsis, entitled The Impact of an Airport which summarised the key findings of the main study. This companion publication will help ensure that the key results from the study are as widely disseminated as possible, without undermining the authority of the source document. The synopsis also considered some of the practical policy implications of these findings. If the full economic fruits of a healthy aviation sector are to be fully enjoyed by European citizens, there are a number of steps which both national and EU decision-makers will need to take. Firstly, the looming airport capacity crunch will need to be addressed. The Economic Impact of European Airports study, based on EUROCONTROL passenger projections, estimates that by 2035 a potential 2 million jobs, and €97 billion of GDP will be lost each year, due to insufficient airport capacity, unless action is taken now. In addition it is essential that Europe deepens its connections with those regions in the world which are fast becoming centres of global wealth and economic activity. EU-negotiated aviation agreements implementing open sky regimes with key trading partners will be crucial in this respect. Aviation taxes need to remain off the table, and to be abolished where they remain in place. Small open economies such as Ireland, Denmark and the Netherlands have already experienced the wider damaging effect on national economies associated with such measures, and have repealed their own individual taxes. Finally, operating costs need to remain as low as possible, if Europe is to retain its competitive position globally. Regulation needs to be proportionate, fit for purpose and streamlined. In this respect consideration should be given to the public funding of aviation security. Failing this, a more focused, risk-based approach should be put in place. 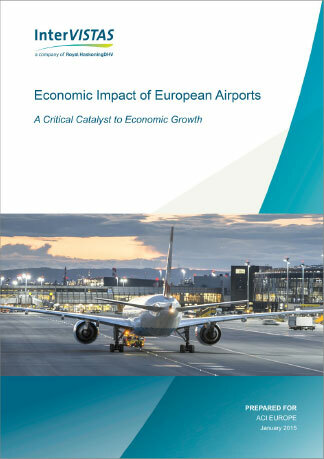 Both the main Economic Impact of European Airports study and its companion synopsis The Economic Impact of an Airport are available in the policy section of the ACI EUROPE website.